The first big signal that even today’s fundamental managers need new tools came in August, 2007. Before the financial crisis, there was the great quant meltdown. Partly precipitated by the failure of several Bear Stearns mortgage funds, large quantitative funds that traded with many times their leverage had to quickly exit positions, pushing down the value of many seemingly good companies. To anyone looking back on a chart of the S&P 500, that August downturn just looks like another instance of market volatility. And for those who were able to hold onto their positions through the volatility that’s just what it was. But for fundamental managers whose approach was being mirrored by quant funds, it was a rude awakening that their portfolios were significantly exposed to a previously ignored type of risk, factor risk. As explained in the previous post, factors were really popularized by Fama and French with their 1993 paper explaining how price to book (a generic proxy for value) and the relative market capitalization of a stock have significant explanatory power in predicting stock return addition to market beta and the risk free rate. Fama and French weren’t the first to identify market anomalies, but they were the ones who put relatively persistent market anomalies into a framework that made allocating capital to practitioners to capture these inefficiencies, also labelled as systemic risk factors, much more respectable. There has been an ongoing debate around whether the outperformance offered by popular factors (Value, Momentum, Size, etc..) are due to systemic risk or to market inefficiency. However, now that there are multiple quantitatively oriented institutions managing billions of dollars putting money into factor strategies there is no question that popular factors carry with them some additional aspect of risk. This became undeniable after the August 2007 quant meltdown. A combination of the unwinding of popular quant strategies combined with a temporary withdrawal of market makers led to massive losses for most quantitative investors and any fundamental manager who happened to be unlucky enough to be mimicking certain popular quantitative factors in their portfolios. There was nothing wrong with the companies at the time, and anyone able to hold on through the panic quickly made their money back. But there was no question that holding a portfolio of stocks that looked similar to portfolios held by quantitative hedge funds carried new risks. Since then, there have been numerous other time periods when the main driver behind a stock’s movement were not as related to its fundamentals as it was to the large groups of investors who focus on factor investing that were moving money into or out of stocks. Knowing that a market movement is being caused by a force external to economic or company fundamentals can give a portfolio manager the confidence to weather the storm, or even add to their portfolio as they reinterpret erratic market movements as a short term sale to pick up more of their favorite cheap stocks. 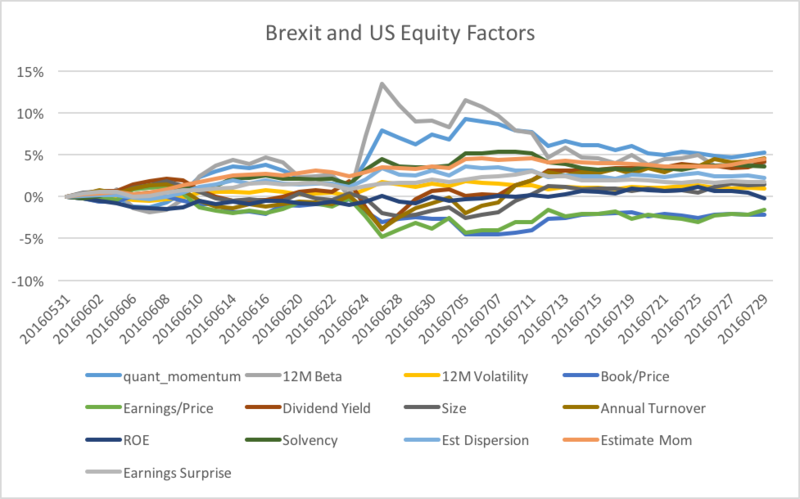 The most recent example is Brexit, which caused a lot of portfolio managers to head to the door at once. On June 23rd, the UK surprised markets by voting to leave the EU. The market reaction to this vote was one of panic and volatility. Any errant exposure to common factors (such as Momentum, Beta, Volatility, etc. ), as shown in the chart above, would have significantly added to a portfolio’s volatility. It doesn’t take an external shock to drive quant investors towards the exit. It only requires constant underperformance combined with leverage. Fundamental investors need to track their exposures to popular factors not just so they know if their portfolio looks like one that can generate systematic outperformance through known ways or to prevent style drift. They need to keep track of their exposure to quant-induced market swings. One way to do that is to look at factor exposure. Factor exposure can be thought of as a portfolio’s beta to the underlying factor index. Factor indices are created by going long stocks in the top decile, or the decile expected to outperform, of a factor and short stocks in the bottom decile, or the decile of stocks expected to underperform. Let’s return again to the Berkshire 13F portfolio. We can look at their exposure across a variety of factors. The main factor exposures Berkshire is exposed to are size, 12M Vol and ROE. The volatility of these factors has been relatively muted. It’s almost hard to spot the Brexit vote on the chart above. Figuring out which common factors the portfolio is exposed to, and then determining whether those factors look like crowded trades is a key aspect of risk management that many investors are only peripherally aware of. Going forward, we’ll track and highlight factor returns both to keep up with market trends and to spot when certain factors might be developing bandwagon exposure as more quant funds jump into trades that work.